#1 – Canada Maple Leafs – The Canadian Maple Leaf has long been a staple item for world bullion coin collectors. The first silver Canada Maple Leaf was issued in 1988, and the series has become one of the most popular bullion coin programs in the world. #2 – China Pandas – The China Panda silver coin has been around since 1982 and is now one of the most widely known Asian bullion coins. 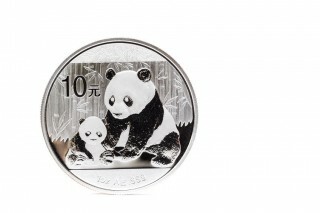 China Pandas are noted for their exceptional quality and beautiful designs, which change periodically, frequently giving collectors something new to enjoy about the series. #3 – Mexican Libertads – Before the United States offered the American Silver Eagle in 1986 and Canada struck the Maple Leaf in 1988, the only North American nation to strike a silver bullion coin was Mexico. Since its inception in 1982, the Mexican Libertad has become a leading silver bullion coin and is regularly collected by hobbyists who assemble sets of world silver coins. #4 – Austrian Philharmonics – The 1.5 euro silver Philharmonic coin ranks among the most popular one-ounce silver coins from Europe. The design features Vienna's Golden Hall on the obverse and a variety of musical instruments on the reverse, symbolizing the nation's longstanding art culture. #5 – Great Britain Britannias – The Great Britain Britannia is a 2 pound coin featuring a woman figure known as Britannia who symbolizes the nation's strength. Since the first Britannia silver coins were released in 1997, they have become popular with collectors in Britain and in other nations around the world. #6 – The Cook Islands Bountys – The $1 Bounty silver coin depicts the HMS Bounty, a British Royal Navy ship that in 1789 was seized by mutineers and became the subject of a novel and a movie known as Mutiny on the Bounty. The $1 Bounty silver coins have been issued by the New Zealand dependency of the Cook Islands since 2009 and the coins remain popular with collectors today. #7 – New Zealand Silver Kiwis – The $1 Kiwi silver bullion coin pays homage to the iconic flightless bird that serves as a national symbol for New Zealand. The silver bullion coins have been minted since 2012 and are especially popular with hobbyists who enjoy collecting coins with nature themes. #8 – Tokelau Islands Lunar coins – The nation's Lunar silver coin series is issued with a $5 face value and depicts various figures from the Chinese calendar, which is based on moon cycles. The series kicked off in 2013 with the Year of the Snake coin and in 2017 honors the Year of the Rooster. #9 – Armenia 500 Drams – The 500 Dram silver bullion coin from Armenia depicts one of the most epic Biblical subjects of them all: Noah's Ark. Since its introduction in 2011, the Armenia 500 Dram silver bullion coin has gained in popularity with theology scholars, topical hobbyists who enjoy collecting coins depicting boats, and those who pursue world silver coins in general. #10 – Australia silver bullion coins – Australia may be the known as "The Land Down Under," but it goes over the top in producing a plethora of some of the world's finest silver bullion coins. On tap in 2017 are a variety of beautiful silver bullion coins, including the Silver Koala, Silver Kookaburra, Silver Kangaroo, Silver Dragon, Silver Rooster, Silver Swan, and Silver Phoenix. Any of the world silver coins mentioned above can be purchased from bullion distributors, such as coin dealers and precious metals brokers. While proof specimens of these coins routinely sell for much higher prices than their intrinsic silver spot, bullion examples usually retail for only a few dollars above current melt values.